Jordan and Rays success in the fitness industry has sparked media attention. The pair have found tremendous success in the fitness industry, thanks to their hard work, friendly personalities and personal approach. But they also pride themselves on being, well, ‘normal’ as they put it. And understanding exactly the struggles their clients are going through as they endeavour to live a healthy lifestyle. “A newly-engaged couple have revealed how they both went from being bullied at school over their weight to becoming bodybuilding champions. Jordan Saunders, 21, tipped the scales at 11st by the time she was 11 years old, and had braces, glasses and ginger hair; while Ray Bath, 26, was teased at school over his puppy fat. These days, Miss Saunders and Mr Bath, who met at a gym and are based in Basildon, Essex, are lean dieters with their own personal training business, and plan to marry next September in Cyprus.”. 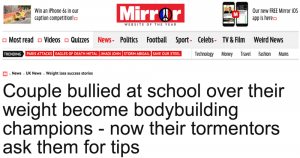 “A couple who were bullied at school become bodybuilding champions – and now bullies ask them for tips on how to lose weight. Jordan Saunders tipped the scales at 11 stone at just 11-years-old, making her a target for cruel school bullies. Determined to shape up she hit the gym and shed three stone in just a few months, slimming down to eight stone. A COUPLE who were bullied because of their weight are now making a name in the world of fitness. Jordan Saunders, 21, and fiance Ray Bath, 26, regularly compete in Fitness Model competitions displaying their toned muscles. The pair, both overweight as children, have even started a personal training business after their competition success. The engaged couple met at the gym. They now own a their own personal training business and are getting married next September in Cyprus. Two and half years ago, Jordan Saunders was known as the ‘bigger friend’ and the ‘dustbin at the dinner table. That’s not to say she didn’t enjoy fitness, after all she trained as a competitive swimmer until the age of 16 staring at that black line at the bottom of the pool for 20+ hours a week, not to mention the competitions and 5am starts. When she left the competitive swimming world behind, Jordan found refuge in the gym as a cardio bunny. She, like many other females, believed that eating less and running more meant weight loss. To her frustration, though, she found this wasn’t the case. Just over two and half years ago Jordan started lifting weights seriously and for the first time in years she noticed the real change in her body. Suffering from being overweight as a teen then experiencing an eating disorder later on in her teens, in her own words “I can finally say I am the happiest and healthiest I have ever been”. She has always been into fitness as she was a competitive swimmer from a young age and had the discipline for 20 hours plus training a week and 5am starts, but nutrition was her main problem and her relationship with food was unhealthy, from over indulging to eating next to nothing.